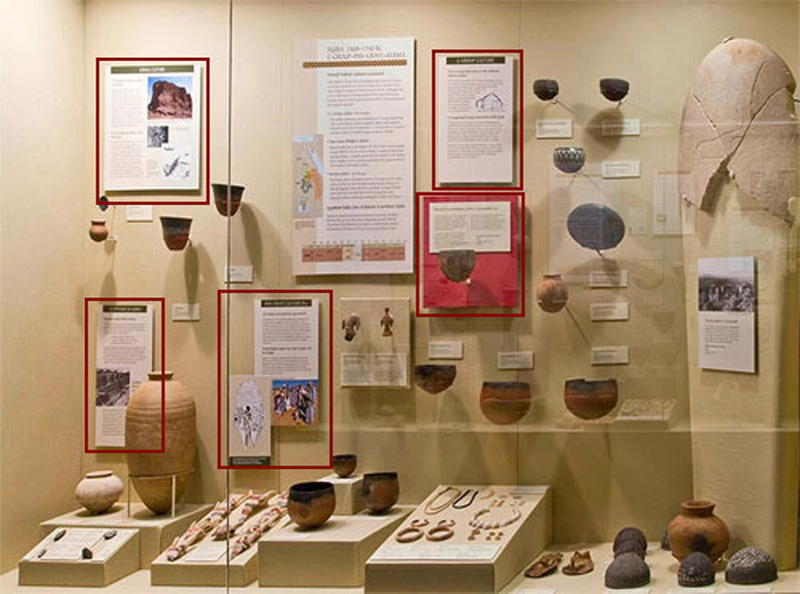 Three distinct cultures that archaeologists have named C-Group, Pan-Grave, and Kerma are found in Nubia from 2400 BC to the time of Egypt‘s conquest of Nubia around 1550 BC. Although they were in close contact for long periods of time and shared many features, such as round houses and tombs, these cultures maintained their separate identities. The modest settlements and cemeteries of C-Group culture have roots in sub-Saharan African traditions where cattle had both economic and symbolic importance. C-Group culture is found in northern Sudan and southern Egypt as early as 2400 BC. Round burials that archaeologists call “Pan-Graves” start to appear around 1800 BC. The Pan-Grave culture is commonly associated with the Medjay, a nomadic group that lived mostly in the eastern desert. Medjay warriors served prominently with Egyptian military forces both in Nubia and in Egypt. The Kerma culture developed near the 3rd cataract from earlier cultures in the area and included wealthy burials of kings. By 2000 BC Egyptian texts called this area Kush. Around 1650 BC, rulers of Kerma extended their control toward the north, annexing northern Nubia and coming into conflict with Egypt. Egyptians constructed massive fortresses in the rocky stretches between the 1st and 2nd cataracts beginning around 2000 BC. This chain of fortifications was meant to control trade and the movements of Nubians in the face of growing Nubian power.